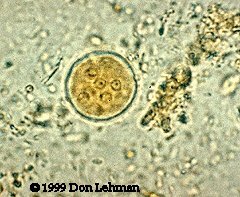 The cyst of Entamoeba coli, shown at right, measures between 15 and 25 µm in diameter. The key identification feature is the number of nuclei. 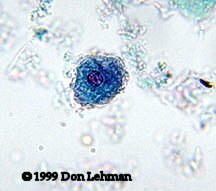 A mature cyst will have 8 nuclei; occasionally immature cysts with 2 nuclei will be seen. The image at right is an iodine wet-mount (1000x). The trophozoites of E. coli typically have a diameter of 20 to 25 µm. They exhibit sluggish motility and have blunt pseudopods. The peripheral chromatin is often clumped and unevenly distributed. The image at the left is a trichrome stain (1000x).